Please enjoy the blog header photo this week by Edgar Martins titled The Accidental Theorist. 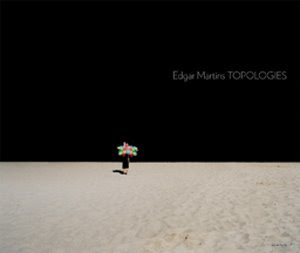 ARTmostfierce recommends the new Topologies book by Edgar Martins published by Aperture Foundation. For more info please find links below or contact Kellie McLaughlin Manager of Limited Edition Prints at 212.505.5555. Paper: 17" X 20 1/6"
Image: 13 1/16" X 16 5/8"
Here is a brief summary review of the book followed by an interview with Edgar Martins. 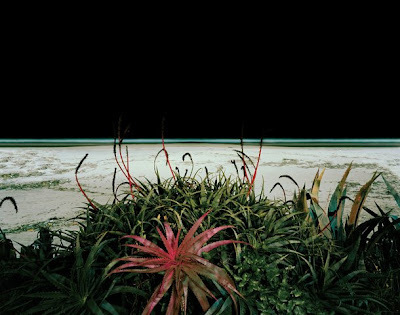 Edgar Martins photographs have an absence of life, a paucity of purpose, and a sense of the uncanny that permeates the silence of them, whose scenes, like a black hole, seem to have consumed all traces and signs of life. The sun has been usurped, in its absence, by a mysterious source of lighting, that pushes back the blackness of the night and we are obliged to fill in the absences that it relentlessly exposes. All that represents the ambience of a holiday beach is missing. The pervasive tranquillity is paradoxical, not calming but disturbing, discordant, incongruous, the viewer longs for the signs and symptoms of life to pump up the visual volume and superimpose the social identity of this place. Given the paucity of clues offered, our curiosity is inevitably aroused and the detective in us begins to prowl around these scenes. The possibilities proliferate but there are always more questions than answers, always more assumed reasons than reality could hold down. This is the flip side of Massimo Vitali’s photographs of North Italian beaches which teem with life and action where our gaze becomes satiated by detail, our eyes and our minds held firmly within the frame, here in these images our mind begins to wander beyond the frame. In an attempt to reinforce the rickety ontology of this work we are tempted to rove beyond the confines of the frame, under the red-hot glare of analysis the frame begins to melt, imagination breaks through its thwarted threshold, the party’s over and we want to find out where the revellers have gone, denied access to the social raison d’ettre of this scene we inhabit it with our own imagined populations and their narratives. 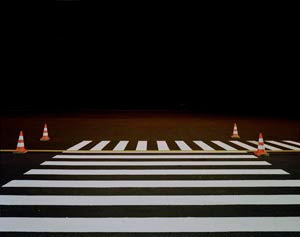 The solid blackness in these images has an air of the supernatural reinforcing that intangible yet somehow persistent presence of the uncanny – an abyss whose threshold teeters on the edge of credibility, where the indexicality of the image can only be tentatively maintained by the viewers suspension of disbelief. Edgar Martins: I know what you are saying. Yesterday (at the book signing lecture) I mentioned that what I have been trying to do is to create a new visual language with which to work with. It all comes down to this. AMF: And then you go the other way and you are dealing with very organic forms and organic landscapes and they seem to have the same order and abstractions too. EM: Yes, when you are dealing with organic forms and shapes and landscapes there is only so much stripping down you can do -- particularly when you are photographing forests. The starting point is different. And this dictates how the final images will pan out. AMF: There is a photo in particular, the one in Iceland, a winter landscape that has several tire tracks in the road and the eye goes to mountain and it leads you to a creation of triangular compositions of all kinds in its surroundings? It is sort of endless. Are you aware that people are looking at your art and they are seeing all these things, maybe because your eye is so trained on it, but they see things that you might not even see yourself? EM: I know what you are saying with the triangle composition, because part of my work deals with the process of producing and reading images. They are images about images, so to speak (meta-images) -- those landscapes also refer to a history of landscapes. And you know its true that the eye tends to read images in a certain way. So when you are stripping down images and if you really want it to work, whether you are doing it consciously or not, you end up following a certain visual structure, but it’s not a conscious geometry, you know, I am making use of very simple tools which photography has to offer such as the depth of field , perspective, color, density, etc. If the images are deceptive and illusionary is because photography has these qualities. AMF: Were you involved with graphic design or any kind of design at some earlier point in your life ? EM: I studied visual arts, I also study additional things outside of the visual arts, like philosophy, social sciences and urbanism. I followed architecture, definitely, with the kind of work that I do it is impossible not to follow architecture. Architecture is present everywhere. And if your work deals with the impact of modernism on the environment, then architecture is an important subject in your images. AMF: You don’t photograph people. What is the reasoning or is there a purpose behind it? EM: You know, I always have a fascination with empty spaces because it gives me a blank canvas onto which to project one's own experiences. But there is also something more interesting which is, you know, it is probably the easiest and most objective way to make people revisit places they already know, thus providing them with a different experience of those spaces. I mean every space has a use. AMF: Oh, meaning like people imagining themselves in the space or image what they would do if they were there? EM: Yes, because people take spaces for granted. They go past them every day, and perhaps if they crossed them at a different time of the day they may look at them in a different way. But you know someone yesterday told me that even though the spaces were empty there was a certain humanity in these places. And you know I think that that is important, actually, because when they are empty, it becomes easier for people to project their own humanity in these spaces. When I photograph I don’t do any post production to the images, either in the darkroom or digitally, because it erodes the process. So I respect the essence of these spaces. Also any one can take a picture. And anyone with a bit of training can take a beautiful, eye-catching picture. AMF: I also understand that you worked with the fire department in Portugal. Did they ask you to do that, to be able to document and be so close to the fires? EM: No, it wasn’t actually like that .. what I tried to do initially, in order to photograph these fires, was to contact a local fire Brigade. I proposed to do residency with them. I actually lived in the fire station for a period of 10 days. However, it seemed to me that during this time there were fires happening all over the country, except in that specific area. They had very little jurisdiction so I decided to take matter into my own hands and so liaised with the Civil Protection Unit, which coordinates all the fire brigades in Portugal. So I rang them up at 7:00 every morning and asked them to give me the details of where the fires were, how big they were, how many fire brigades were at that spot and then they gave me the coordinates to the place. That was really the only interaction I had with them. AMF: What was the reasoning of your taking those photos? Was there a message? Some sort of environmental message? EM: Well, no, but you can’t disassociate the project from that. These fires have a catastrophic effect in the landscape. AMF: Did it bother you? EM: It was the only project that I remember pausing, looking at what I was photographing and feeling quite emotional about it. Perhaps because of the devastation and maybe because I felt completely impotent to do anything about it. The experience of the space was totally different. I was in the presence of death. An all consuming act. Usually I am excited I am focused, I am concentrated. But you know the reason why started working on this project was because it was going to be the third chapter of a book, which portrayed foggy landscapes in the first two chapters. It occurred to me that at first glance the aftermath of these fires also looked like foggy landscapes, beautiful arcadian depictions of specific landscapes. However, something more sinister was taking place. The editing of these three chapters together made the viewer confront him/herself with an interesting dichotomy. Only towards the end of the third chapter that I started revealing the fires in their true capacity. Until then the images were somewhat ambiguous, so the smoky haze could be confused with mist or fog. I am always very careful not to demystify things or to reveal hidden narratives. For the most part it is the viewer who has to come to these realisations on his/her own and in his/her own time. AMF: You took these photographs in Portugal, The Azores Islands and then you have photographs in Iceland. Is there a reason why you chose such drastic environments to photograph? EM: I am not a travel photographer. I am very critical of people who produce whole bodies of work in 3 days, in places they hardly know. I carefully research the spaces I photograph, often revisiting them over a period of time. Portugal, the Azores and Iceland fitted the criteria I was searching for. I know some of these spaces well, which also helped. AMF: I know you are originally from Portugal . Were you going home in a way by documenting it? What about Iceland? EM: No, I don’t think I was going home at all (Portugal). My home is still China. These locations suited the criteria I was looking for. In Portugal access to specific sites is easier, less bureaucratic. And the landscape also has a lot to offer. Iceland because the terrain is stark and remote, and secondly, because, you know, for about 6 or 7 months of the year the roads literally close and the interior of Iceland is impenetrable. I really wanted to experience those harsh conditions, recreating the early topographic surveys. AMF: Who is your favorite American photographer? 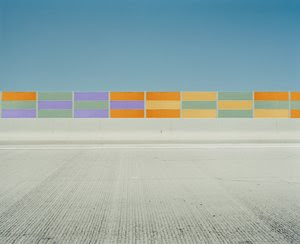 AMF: The sound barriers in Portugal...The photos are completely geometrical and full of color composition. What was your main intention of documenting it? AMF: Those are quite stunning and the variety of composition and color between them is quite exceptional. Thank you Edgar for sharing your thoughts with all of us! Great interview! I love, love, love Edgar's work. It would be interesting for artmostfierce to revisit Martin's work in light of the evidence of digital manipulation that has been found in a series he did for the NY Times. It's interesting to revisit his work in general, knowing what we do now. Extensive manipulation seems to be everywhere. I guess what I really wonder is: Is this a statement by him, or is he just a schmuck? I'm betting it's the latter, but he'll claim the former. I think this matter of him being dishonest exposes a prejudice in the fine art photo world against a certain type of photo manipulation. For example, it's so much better to have an artistic eye for seeing uncanny symmetries in the real world than it is to simply cut a photo in half and flop it. Martins has used that prejudice to his benefit. How did he think he wouldn't get caught eventually? When I interviewed Edgar Martins, he stated that he did not manipulated any of his work. I just reported what I was told. I am not a big fan or collector of highly manipulated images unless, the process takes photography to another level. Thanks for the update and yes, I will look into it. Well, bad things happen (to good people?). Paris is burning with Richard Serra! Zoe Strauss, Philly & Brotherly Love! Jean Nouvel Architect of the moment! Chinese Art Continues to Soar!